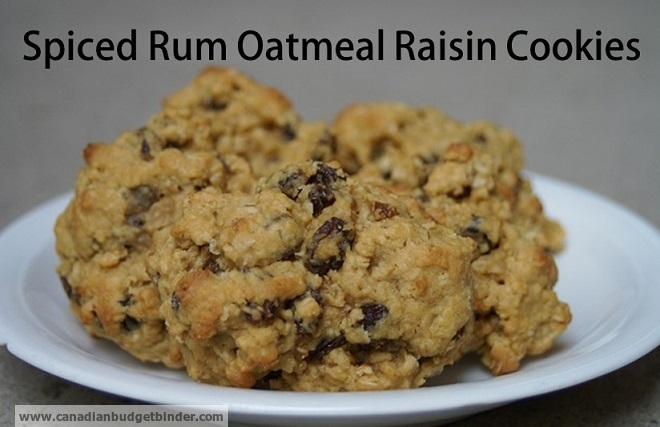 If oatmeal raisin cookies are what you fancy you must try my spiced rum oatmeal raisin cookies. My wife and I are both fans of oatmeal raisin cookies especially if they are chewy oatmeal raisin cookies. I don’t know why I thought about spicing up the oatmeal raisin cookie but I’m glad I did. Now I can’t keep these oatmeal raisin cookies in the house long enough before the cookie jar is empty. The best part about these oatmeal raisin cookies is that they are easy to make and use everyday pantry items that most people have on hand if they keep a stocked baking pantry. I didn’t add traditional spices from the spice cabinet rather I soaked the raisins over-night in Bacardi Spiced Rum. You don’t need lots of rum to soak your raisins so don’t go hog-wild trying to drunken them up. All you need to do is add a 1/4 cup of spiced rum to 2 cups of raisins and cover over-night on the counter. In the morning you will have plump, juicy spiced rum raisins that will change the taste of your oatmeal cookies forever. My sister-in-law came over and managed to scoop up a couple of the cookies and now she is always asking me to make them. I’ve had raisins soaking for a few days now but haven’t managed to bake the cookies since my wife just had a baby. One thing home bakers need to remember is that when you are learning how to bake cookies that you must never over-bake the cookies. If you bake cookies too long you will have hard and sometimes burnt cookies once they cool down. If you didn’t already know cookies continue to cook if you leave them on the baking sheet once you take them from the oven. I always remove my cookies after a couple of minutes of cooling time to a cooling rack. When I made these oatmeal cookies I wanted them to be chewy and thick because this is the way we enjoy our cookies. We don’t particularly enjoy the flat cookie so we lean more towards the drop cookie which we refrigerate for about thirty minutes so it holds that thick shape. I also find if I refrigerate my cookie batter that it creates more of a chewy oatmeal cookie over the traditional hard oatmeal cookies. Some of the best oatmeal raisin cookies I’ve ever had were homemade cookies which are far better than store-bought cookies. With fall beginning tomorrow and the Christmas countdown started for many these easy oatmeal raisin cookies would be great to offer to your family and guests. If you have to attend a pot-luck or are having a bake sale these are great cookies that will fly off the table once people find out that spiced rum is the star ingredient. If you don’t like the spiced rum you can use a coconut rum which I have done although the flavour is not as powerful as the spiced rum. If you simply don’t like rum you can leave it out because all you are really doing is soaking the raisins to plump them full of flavour. These spiced rum oatmeal raisin cookies will not last long in your cookie jar if you make them for the holidays or as an everyday cookie. They are soft and chewy and thick built as they are refrigerated and dropped on the cookie sheet. Drop cookie batter onto a non-stick baking sheet using ice-cream scoop leaving space as they spread just a little bit. I put three per row. Remove from oven and after a couple of minutes put onto a cooling rack and enjoy hot or cooled. I find once they cool the flavours are more prominent. If you are looking for an easy oatmeal cookie recipe this is the one however if you want to soak the raisins remember they must be done overnight. It’s worth the wait to make sure your raisins are soaked in the spiced rum as it really does change the overall taste of this delicious oatmeal raisin cookie. I prepared this spiced rum oatmeal raisin cookies for my children. They liked it because I added honey and milk. Still, I should have soaked the raisins overnight. It seems like they still liked it very much and looking forward to another one. Thanks for the recipe. These do look good!!! I think the younger boy was hinting earlier as he asked me if I had looked a t the recipe yet…. Maybe one of the boys will get me some of the spiced rum next time they walk down to the LCBO!!! From the quantity I’d think one of those little bitty bottles would be plenty of rum even if I double the recipe. Thanksgiving is coming and we will likely be going to my SIL’s place and she likes rum but only in eggnog…wonder how she would like these cookies…. I need to get to the bulk store for a big bag of Thompson raisins. Those are my preference as they are less likely to be treated with sulphur as a preservative. Hopefully I can get what I need when I get there for my Christmas baking and start soon!! !